ABU DHABI: Pope Francis landed in the United Arab Emirates yesterday for the first ever visit by a pontiff to the Arabian Peninsula – the birthplace of Islam. The pope touched down in Abu Dhabi for the 48-hour trip during which he will meet leading Muslim clerics and hold an open-air mass for some 135,000 Catholics. The pontiff will take part in an interreligious conference today, meeting Sheikh Ahmed Al-Tayeb, the imam of Cairo’s Al-Azhar, Sunni Islam’s prestigious seat of learning. Hours before he flies back to Rome tomorrow, he will lead mass in a stadium in Abu Dhabi – set to be the largest gathering ever in the UAE, according to local media. His visit comes with the UAE engaged in a long-running military campaign in Yemen and embroiled in a diplomatic spat with nearby Qatar. Before heading to the Gulf, the pontiff urged warring parties in Yemen, where the UAE backs the government against Houthi rebels, to respect a truce agreement. Nearly one million Catholic migrants reside in the UAE, mostly hailing from the Philippines and India. Around 135,000 have secured precious tickets to tomorrow’s mass at Zayed Sports City Stadium. Yesterday morning, hundreds of Catholics queued in drizzling rain outside St. Joseph’s Cathedral in Abu Dhabi to get their passes. “I think the pope coming really opens doors for conversations about tolerance that the whole world needs to hear,” said Collins Cochet Ryan, a 39-year-old expectant mother from the US. For Indian Doris D’Souza, who lives in Goa, Pope Francis’s trip to the UAE was not to be missed. “Since I came to know about the pope’s visit to Abu Dhabi, we jumped (at) the opportunity to be witness.” The UAE capital’s main streets and those leading to St. Joseph’s Cathedral – which the pope is set to visit tomorrow – were lined with Vatican City flags and banners of the interreligious meeting. 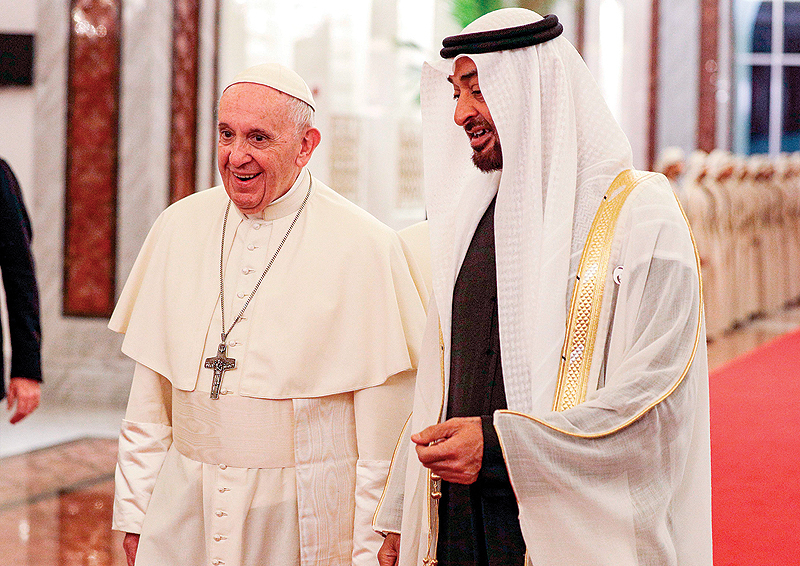 UAE minister of state for foreign affairs Anwar Gargash extended an official welcome to Pope Francis yesterday. “It is a visit that carries great humanitarian value, and the UAE adds a new (chapter) in the history of fraternity and tolerance,” he tweeted. He took an apparent jab at Qatar, which hosts Islamist cleric Youssef Al-Qardawi and is engaged in a bitter standoff with its Gulf rivals. Gargash pointed out the difference “between those hosting a cleric of violence and terrorism… and those who host the pope and the Al-Azhar sheikh for a dialogue of love and communication”. The UAE, along with Saudi Arabia, Bahrain and Egypt, cut all ties with Doha in June 2017 over allegations it supports extremists. The UAE prides itself on its religious tolerance and cultural diversity. It has eight Catholic churches. Oman, Kuwait and Yemen each have four. Qatar and Bahrain have one each, while ultraconservative Sunni powerhouse Saudi Arabia bans all non-Muslim places of worship. The UAE ambassador to Washington, Yousef Al-Otaiba, wrote in an op-ed in Politico magazine yesterday that the pontiff’s visit sends a signal of co-existence and respect in the face of the “menace of extremism” across the Middle East. The UAE has however been criticized by rights groups for its involvement in a bloody Saudi-led military intervention in Yemen, where an estimated 10,000 people have been killed in four years of war. Millions of Yemenis face imminent starvation, according to the UN. Rights groups have also slammed the Gulf state for upholding a 10-year prison term against activist Ahmed Mansoor on Dec 31 – two weeks after the UAE declared 2019 the “Year of Tolerance”.